BUYING! X Checkout $22.50Buy Now! FadeWheel by Rhythmic Robot is Soundware (e.g. samples or presets that load into other products). 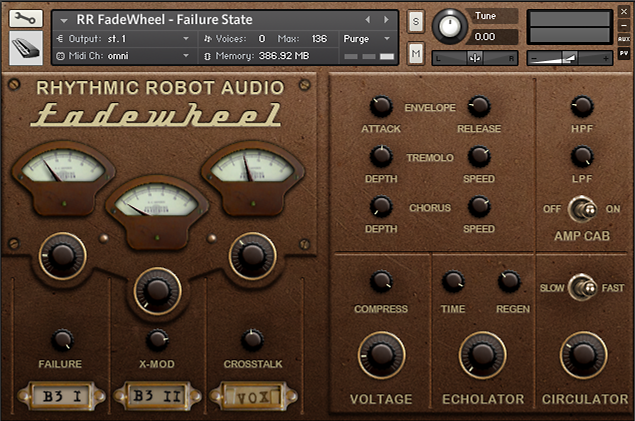 FadeWheel from Rhythmic Robot Audio is a simple but versatile tonewheel organ machine that makes a front-and-centre feature of "failings" such as crosstalk, leakage, intermodulation and component failure. Designed as an antidote to overly-clean organ sounds, FadeWheel allows the user to dial up basic sounds using a simple but flexible combination of three waveform generators – a simple, fundamentals-only B3 wave; a more complex B3 wave with more upper harmonics; and a transistor Vox wave with a lot of atonality – and then progressively to distort and dirty these up using the Crosstalk, X-Mod and Failure controls. Further control over the sound comes from a simple Attack / Release envelope, twin high- and low-pass filters, and a suite of hand-tailored effects (including rotary speaker, chorus, echo, amp cab simulation and distortion). FadeWheel is intended both as an organ simulator but with considerably enhanced levels of grime, grit and dirt; or as a tool for creating soundscapes, pads and radiophonic effects which have an identifiable tonewheel component to them. It is ideal, then, for tracks which want to enhance or exaggerate the vintage failings that typify tonewheel organs; or which want to create synth-type sounds with a tonewheel basis. FadeWheel requires a full version of Kontakt version 4.2.3 or above (including any version of Kontakt 5). Kontakt Player is not supported; FadeWheel will load, but times out after 15 minutes. 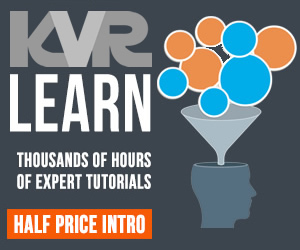 Full audio demos and more information can be found here at the Rhythmic Robot website.